Greetings Earthlings. Have you always wanted to runaway to the circus? Well, we’ve got just the thing for you! You can join up with hundreds of other like-minded folks and runaway to the FERCus. It’s like the circus, only more freaky! Jimmy Betts of Beyond Extreme Energy (BXE) and Rosemary at NoFrackedGasinMass join us for a peak into the worst sideshow on Earth! (that being the corporate captive Federal Energy “Regulatory” Commission) and the upcoming action in May! We’ll do that as well as take you on a trip to The Enviro Show Echo Chamber and to meet The-Fool-on-the-Hill, to Meet the New Boss and more but first it’s time for………..Revenge of the Critters! It’s Magpie swooping season Down Under and far too many two-leggeds are seemingly clueless……but not for long! Our Fool-on-the-Hill this week was captured on national television in full climate denial mode……..O, and he wants to be President. Breakout your tin-foil hats, Enviro Show fans ‘cuz, it’s the Texas bred, Canadian born frat boy from Hell, Ted Cruz who keeps careful tabs on satellites that tell him there’s no Climate Crisis. We have a bit of E-Valley-uation to pass on here: one of our favorite legal beagles, Christobal Bonifaz is going after those outrageous electrical rate hikes. The Greenfield Recorder reports that, “Bonifaz, a Conway lawyer representing the town of Deerfield and some of its residents in their fight to stop the pipeline from passing through town, has sent a letter to Attorney General Maura Healey requesting a formal investigation into the winter electric price hike.” You know, the bogus rate hikes allegedly prompted by a “shortage” of fracked gas infrastructure? We celebrate the anniversary of 1st U.S. town completely illuminated by electric lighting in 1880 by wishing AG Healey happy hunting and passing on some revealing data from David Keith. 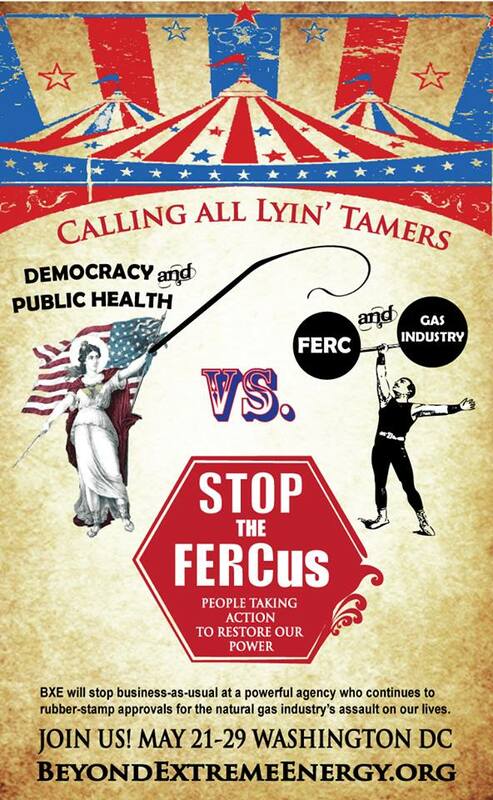 In The Enviro Show Echo Chamber we celebrate FERC Ringmaster, Cheryl LaFleur’s descent from the FERCus!! Also, we echo our previous warnings concerning all the focus on the Keystone XL pipeline with this piece from Common Dreams. KXL is just one of many and 350.org needs to repeatedly make that clear. In fact, Enbridge 61 appears to be even worse! How about a little good news? It looks like FEMA is about to do something right! Deny funds to Climate Crisis denying Govs! Speaking of climate denying governors, remember last time we got into Florida’s weird Gov. Scott and his gag order on saying the words “global warming” or “climate change”? Well, they actually busted someone for that thought crime. Read all about it! Finally, about the drought? In California? Suppose we told you greedy corporados like Nestle are still sucking water out of our National Forests even as critters are dying of thirst and the greens are going dry! Time to Meet the New Boss who, as far as we know, still supports the disastrous TPP trade deal. Checkout what ace consumer advocate Ralph Nader has to say in the wake of recent Wiki Leaks here. Wednesday, April 1. Pipeline Pilgrimage beginning in Pittsfield 4/1 and ending in Dracut 4/12. Go to: http://pipelinepilgrimage.org/logistics/ to find out when they’ll be near your town. Thursday, April 9, 6:30 pm. National Stand Up for Transportation Day! GCC Main Street Campus, 270 Main Street, Greenfield, MA. Contact: Russ Fisher 413-512-1762, TJusticeFC@comcast.net. Sunday, April 12, 2 to 4pm. Screening of “Gasland II – The Dangers of Fracking” Join us at the Arise office on 467 State St in Springfield for a free screening of GASLAND PART II! This is one of a series of events during Public Health Month to raise awareness of, and participation in, the growing Springfield climate justice movement! Thursday, April 23, 7pm. No. Quabbin Pipeline Action will be hosting their April meeting in Montague in conjunction with the Montague pipeline group at the Montague Public Safety building (180 Turnpike Rd.). The meeting, to address updates regarding the anti-pipeline struggle, will begin at 7 pm. However, those unfamiliar with the issue are invited to arrive earlier, at 6:45pm, to learn some of the background regarding the fight. All Franklin County, but especially Montague residents are welcome to attend. OK, that’s enough of that. Move along. Nothing to see here BUT remember to do what? Right. Listen to your Mother!